The compact 10-keyless design optimizes spacing between your keyboard and mouse. Bringing your hands closer together improves ergonomics for long gaming sessions. SteelSeries QX2 mechanical switches deliver dramatically faster gameplay with their low force and linear actuation point. The QX2 switches have a guaranteed life of more than 50 million key presses. Choose from the full spectrum of 16.8 million colors, lighting effects and further immerse yourself with exclusive GameSense event-based lighting. Reactive illumination responds to in-game events like low ammo, health, kills, and more. Premium [Metal]-alloy and a minimalistic exposed keycap design make the centerpiece of your battlestation as sleek as it is tough. 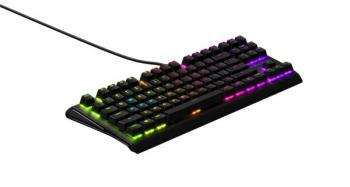 Sync dynamic multi-color lighting effects between all your SteelSeries Prism-enabled gear. From one-click lighting effects to complex light shows, Prism Sync gives you the power to level-up the style of your battlestation. Immerse yourself with exclusive SteelSeries GameSense event-based lighting. Reactive illumination responds to in-game events like low ammo, health, kills, money and cooldown timers. Because every moment is decisive, the Apex M750 TKL is armed with 100% anti-ghosting and full N-Key Rollover ensuring you never lose a match over an unrecognized key press. Take control with SteelSeries Engine Software, featuring the most expansive set of personalization options available. Text based, key-press, and-on-the-fly macros can all be easily programmed.